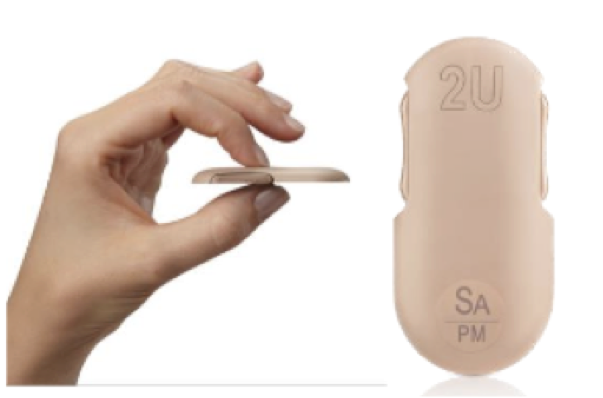 The OneTouch Via – previously called the “Calibra Finesse” – is a highly anticipated mealtime insulin delivery patch device that is now set to launch in mid-2019 in US pharmacies. This exciting product has the potential to make mealtime insulin bolusing easier and more discreet, ultimately giving people a better tool to manage post-meal blood sugars. diaTribe has been following this exciting product since 2010! Johnson & Johnson has sold the device to CeQur, who now plans to take over manufacturing and launch it under a new name next year. The super slim, plastic device is intended to discreetly substitute for mealtime and bolus insulin injections. It is worn on the skin for up to three days and holds up to 200 units of mealtime insulin (Humalog, NovoLog, Fiasp), which the wearer can bolus for in two-unit increments simply by clicking two buttons on the side of the device. It is already FDA cleared for use in people with type 1 and type 2 diabetes. A strong selling point of the Calibra device is that it is entirely mechanical – no electronics, controller, or displays involved. This means it will be more economical than wearing a full-featured pump, and it will be available in pharmacies. To bolus, users simply press two side buttons simultaneously (the design reduces accidental bolusing from bumping into something), and this can be done through clothing. The convenience factor is also made possible by the device’s small size: a quarter of an inch thick, two inches long, and one inch wide (see photo). Since the Calibra device does not deliver basal insulin, people on multiple daily injections still have to take their basal injection (Lantus, Levemir, Toujeo, Tresiba) once a day through their regular pens or syringes. However, given that traditional mealtime insulin delivery involves either tinkering with a pump or injecting with a pen, Calibra is a great convenience win and something many people with type 1 and type 2 will appreciate. The V-Go is another mechanical insulin delivery system that is worn on the body, but the biggest difference is that it has basal insulin delivery in addition to mealtime bolusing. There are three versions that have varying basal insulin delivery capacity (20, 30, or 40 units/day) in addition to 2-unit boluses. The V-Go is already available. There is no pricing information to share for now, but we will update this piece when that information becomes available. CeQur hopes that the device will be covered by Medicare when it launches. What has taken the Calibra device so long to come to market? Calibra, originally a small company based here in the Bay Area, developed this device years ago (See our 2010 article). In 2012, J&J acquired Calibra and planned to bring it to market, subsequently branding it, “One Touch Via.” It took J&J time to get the manufacturing ready – making patch insulin delivery devices at huge scale is not easy. Then, the new manufacturing process required a new FDA submission, which further delayed things. But in early in 2017, J&J announced plans to sell/close its diabetes device businesses, which it has now done by shutting down the Animas pump business last fall, selling its LifeScan blood glucose monitoring business to a firm called Platinum Equity, and through this sale of Calibra to CeQur. 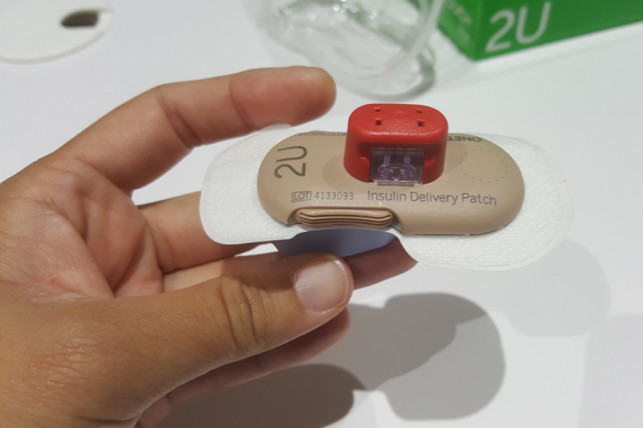 CeQur, a company we’ve followed for a long time, has been developing its own patch insulin delivery device – PAQ. Unlike the bolus-only Calibra, PAQ will offer both basal and bolus insulin in one simple patch delivery device. With this acquisition, CeQur plans to launch the Calibra device first (mid-2019), followed 12-18 months later with the PAQ device.